First, America has been the best country on earth for black folks. It was here that 600,000 black people, brought from Africa in slave ships, grew into a community of 40 million, were introduced to Christian salvation, and reached the greatest levels of freedom and prosperity blacks have ever known.. Wright ought to go down on his knees and thank God he is an American. Barack talks about new 'ladders of opportunity' for blacks. Let him go to Altoona ? And Johnstown, and ask the white kids in Catholic schools how many were visited lately by Ivy League recruiters handing out scholarships for 'deserving' white kids...? Is white America really responsible for the fact that the crime and incarceration rates for African-Americans are seven times those of whiteAmerica ? Is it really white America's fault that illegitimacy in the African-American community has hit 70 percent and the black dropout rate from high schools in some cities has reached 50 percent? OK........... will you pass it on ? YES. I did but will you? Read comments from those who think like you. 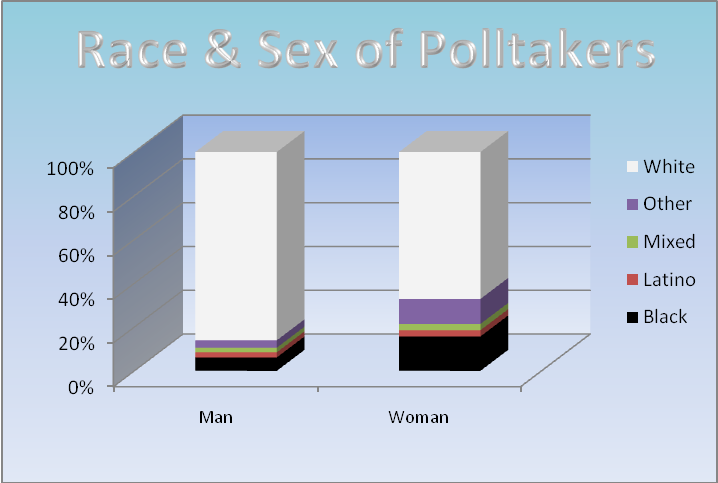 A graphical tour of the respondents. How credible is an internet-based poll? Search phrases used on Google. Once We See Black We NEVER Go Back! Other factors from poll respondents. Comments from blacks who disagree. Detailed Breakdown of Poll Results to date. More than 91% agree with exiling all Blacks, including 25% of Blacks!! Today we reached the 100,000 milestone! More than 100,000 have COMPLETED the poll, more than 6 million have now visited this one page on the internet, more than 60 million Americans are now aware of the poll, and most importantly--more than 91% agree with or "don't know" about at least one of the three exile options. This is a great expose of the power of the mainstream media to mislead, and the power of the internet to reveal the TRUTH!! Thank you, and God Bless all who took so much valuable time to provide such critical knowledge. Thank you to the more than forty thousand who've taken the time to complete the poll since it began a year ago, and especially thank you to those who AGREE to one of three forms of exile. 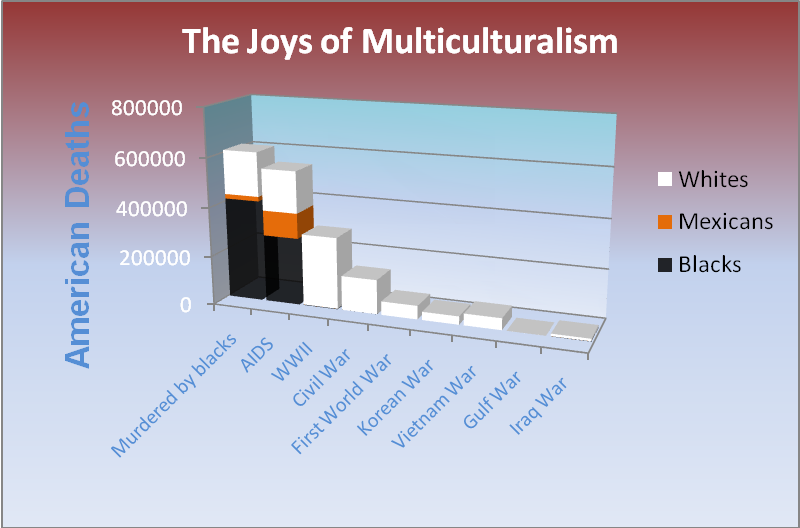 While our "white leaders" pondered the dilemma posed by the invasion of 12-22 million ILLEGAL ALIENS from Mexico and other third world countries, and while they IGNORED the reason the US had FOUR of the cities in the entire world which qualified as "Murder Capitol of the World" [blacks], and while their "judges" ruled that mixed race criminals invading us from third world countries have greater constitutional rights than sovereign White descendants [the "posterity" referred to by our Founding Forefathers in the Preamble] who elected them and paid them taxes, more than 16,000 Americans completed this objective, non-biased internet poll and more than 14,400 agree to date with at least one exile option for blacks. The significance of these results is that, even in these notoriously liberal internet forums, enough people still agree with Black Exile that a constitutional amendment to exile blacks could easily pass. As a test of the tendency of liberals to whine and shout and make themselves appear to be larger numbers than they are, there was no limit on the number of times that someone could vote on the poll in the iii. 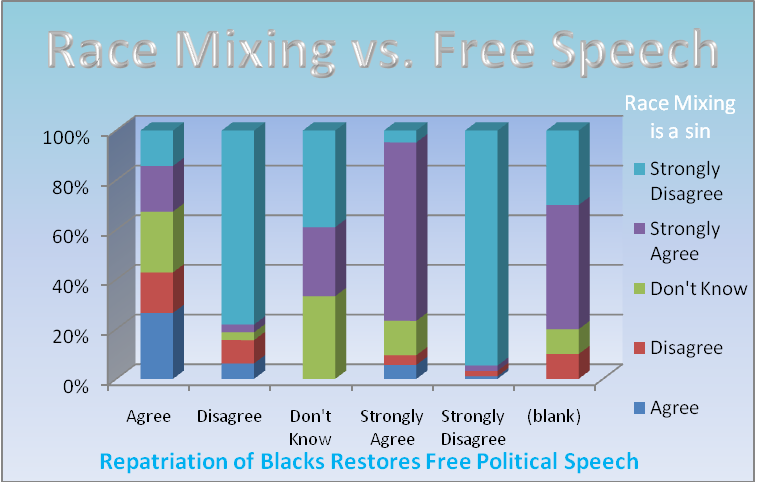 Black Exile Forums, explaining why only 72.1% (compared to 75.6%, 76.6%, and 90.1%) who completed this poll agree with exile. Called friends to have them intentionally bias the poll. Voted a 2nd or 3rd or 4th time from other computers and internet connections and isp's. Succeeded in voting multiple times from their own computer [a tendency which was observed on iv. but which could be easily corrected for because of the way this poll is monitored]. BOTTOM LINE--75%-90% of Americans know that our "white leaders" in DC have let us down, big time! As many as 90% know that their failure to secure our borders, uphold their oaths to defend the US Constitution, punish 320,000 black murderers, remove tens of millions of illegal aliens, was caused by their false flag "the war on terrorism". Because they spit on the blood spilt by our Founding Forefathers, we must spit on their blood! Since this poll began in November 2005, more than 1.2 million visitors have studied the page you're reading right now, and more than 15,000 have completed the poll. The main search engine used to find this page is Google, and you can see the phrases they're searching here which proves that this is statistically random subset of the US population. If the average sphere of influence of each visitor is 10 people, more than 12 million Americans are now aware of this poll--and they're also aware that more than NINETY PERCENT (90%+) are in favor of repatriating blacks to Africa at our earliest convenience. While the mainstream media is religiously dedicated to concealing this KEY issue, the power of the internet has been proven yet again by challenging their most sacred cow--racial integration. A large majority of Whites and Hispanics, and a plurality of blacks, OPPOSE a continuation of our current ruinous course. 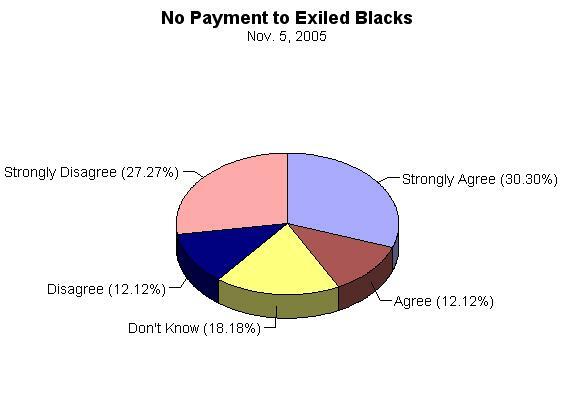 At the current pace, it's anticipated that 1 MILLION visitors will have viewed this poll to exile blacks at 11:30 AM on Saturday, February 18, 2006, meaning that perhaps 10 million people have heard about the fact that the emperor has no clothes: 90% of Americans agree that restoring blacks to Africa as soon as practicable is in the best interests of all involved. The proportion who favor at least one exile option for blacks, ninety percent, isn't likely to change much as the polling continues. But we will keep the poll open and invite other organizations to host the poll on different types of web sites so that comparisons can be made. Internet users from the most leftist forums, AOL and Compuserve, were invited to participate in a mini-poll at http://fathersmanifesto.net/portal . As of this moment, 205 have taken this poll, and only 21.5% "Disagree" or "Strongly Disagree"--proof that even in the most left-leaning groups, the concensus is large enough to easily pass a constitutional amendment. 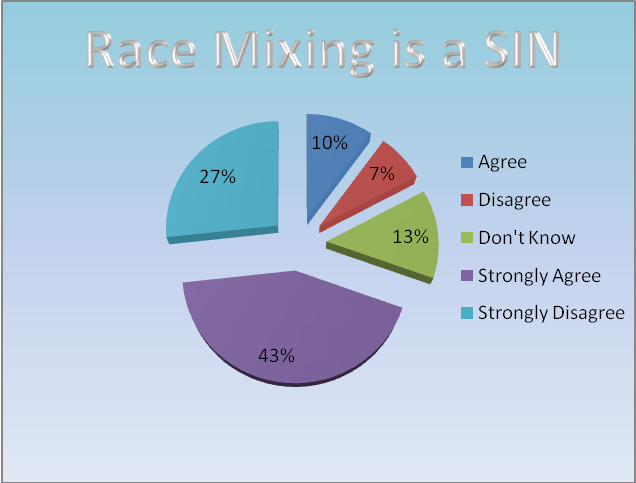 100% of those who agree, don't know, or disagree that race mixing is a sin are in favor of exiling blacks, compared to only 12% who strongly disagree that race mixing is a sin. 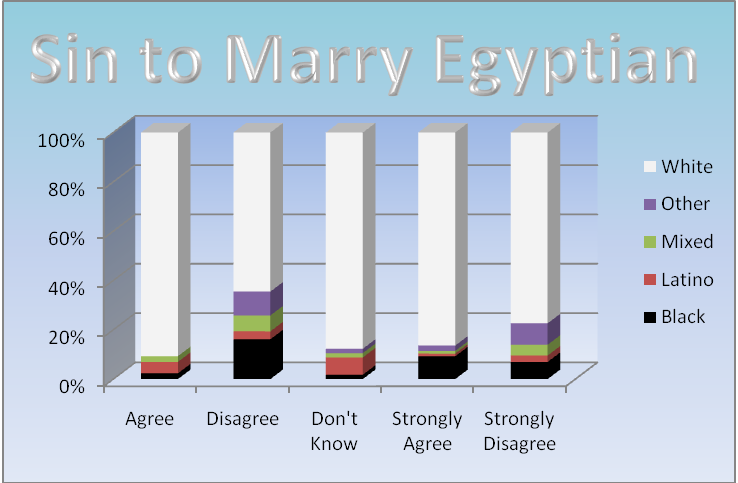 100% of those who agree or don't know that it was a sin for Solomon to marry the daughter of the Pharaoh agree with at least one exile option, compared to only 81% of those who disagree, and 12% of those who strongly disagree. 100% of those who agree or don't know that the Holy Bible refers to blacks as beasts agree with at least one exile option, compared to 81% of those who disagree and 2% who strongly disagree. ONLY 24% OF BLACKS "STRONGLY DISAGREE"
The fact that only 24% of blacks "Strongly Disagree" and 5% "Disagree" with all exile options, reveals that this is not the emotional issue for the greatest majority of blacks which the jews who control our news sources want us to believe it is. The jews who use blacks as a tool to undermine our social fabric make so much noise and get so emotional about such things that this whiney 1.9% of the US population makes themselves out to be 99% of mainstream opinion. But this poll proved that they're a whiney, extremist, amoral, radical, and unpopular [to say the least] minority group which has no right, moral or legal, to impose their amorality on the other 98.1% of us. They talk big behind a microphone or pen, but when this leg is kicked out from under their stool and they come tumbling down like the house of cards they built, we'll discover that these big bags of hot air have no backbone or substance whatsoever. Sure, they'll promise to spill blood in the streets, just as Jesse Jackson and Gloria Allred promised to do if Proposition 209 in California to end affirmative action passed. And they'll produce even less than Jesse and Gloria produced--which was NOT A DROP. Did a single jew match the rhetorical content of their diatribe when the voters easily passed this legitimate democratic mandate to END affirmative action? No. Rather than spilling a drop of blood, or admitting the STUPIDITY of their error,they simply metamorphasized themselves from liberals into neo-conservatives and pretended that they never said such STUPID things in the first place. 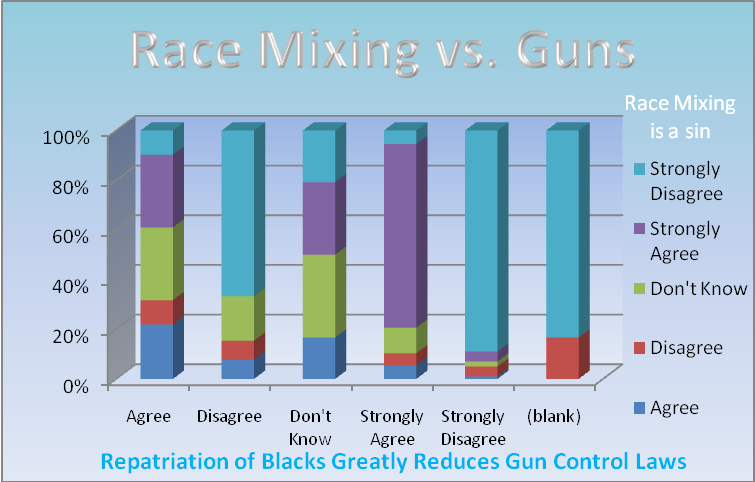 The 17% of those who relate crime and poverty, and who also oppose exiling blacks, are merely liberals whose "moral code" is based solidly on the media sound byte du jour promoted [but not practiced] by jewsmedia, and not Christianity nor any other proven social construct. They have no more credibility, right, nor ability to dictate their amoral agenda on us than jews do. I personally would love to see them exit stage left with the blacks. There's nothing I'd enjoy more in my life than to see the expressions on their faces as we boarded them on the USS Liberia with the blacks and bid them bon voyage. The parade we're going to have in New York City in their honor will be unmatched by any other parade in human history. More than 4,400 have taken the poll!!! 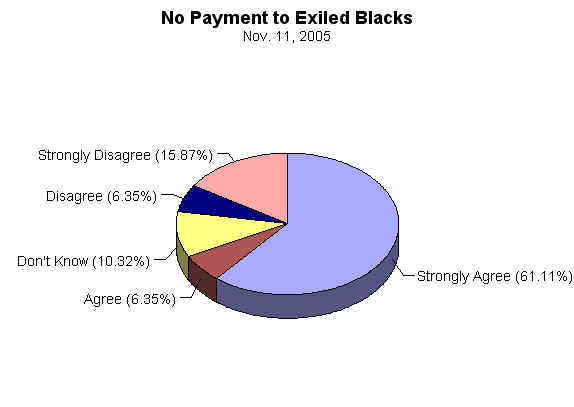 89.96% agree with exiling blacks!!! Not a SINGLE reply suggests harming a SINGLE hair of a SINGLE black!!! This poll is about love, not hate--love of our WHITE RACE. The tide has turned and we're on track for a WHITE Christmas 2006. 3,000 have taken the poll!!! 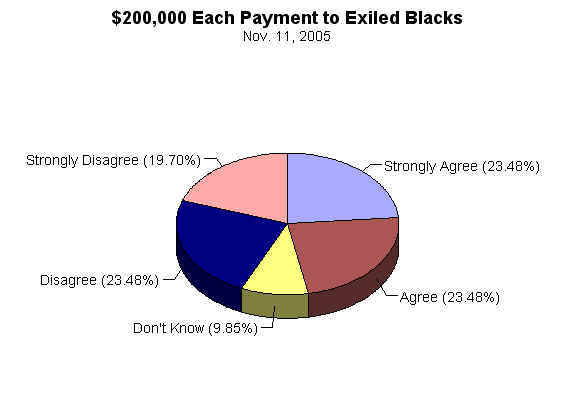 90% agree with exiling blacks!!! 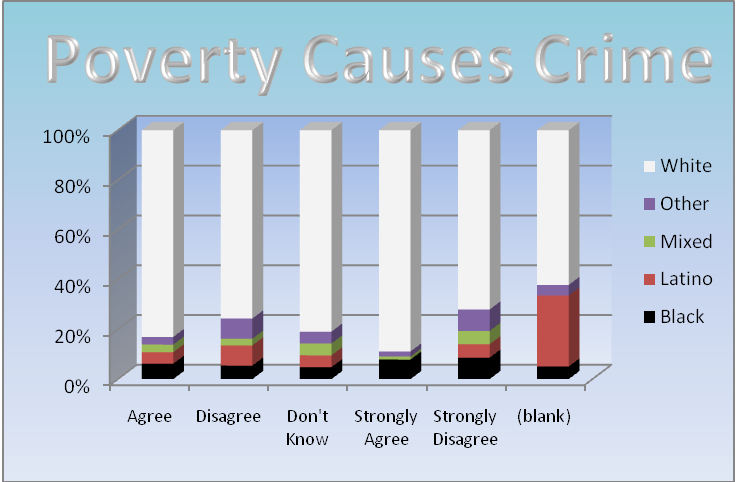 60% of women and 48% of men relate crime and poverty, but 83% STILL agree with exile! 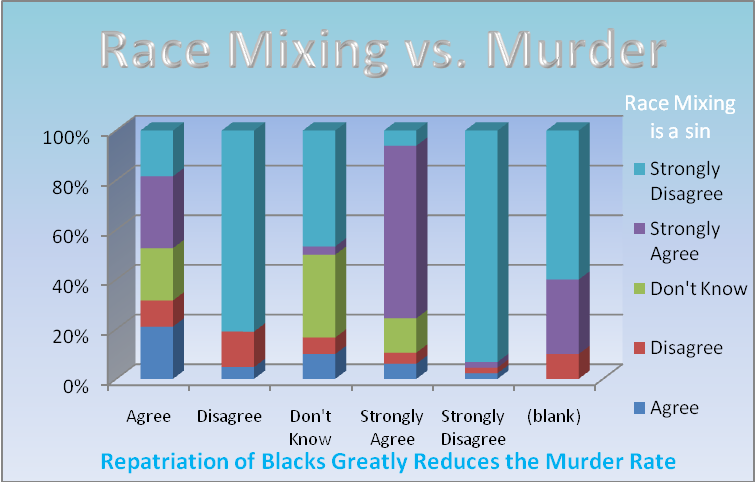 14% of women and 49% of men relate crime and race, and 100% agree with exile! 16% of women and 2% of men relate crime and drugs. 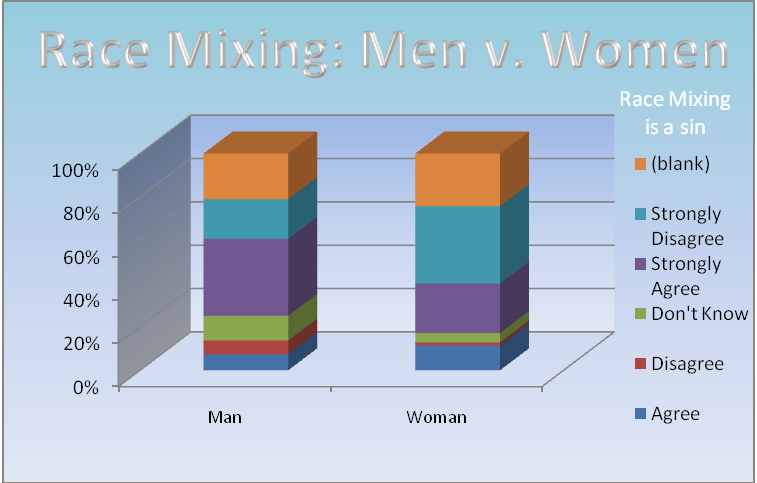 8% of women and 1% of men relate crime and "other". 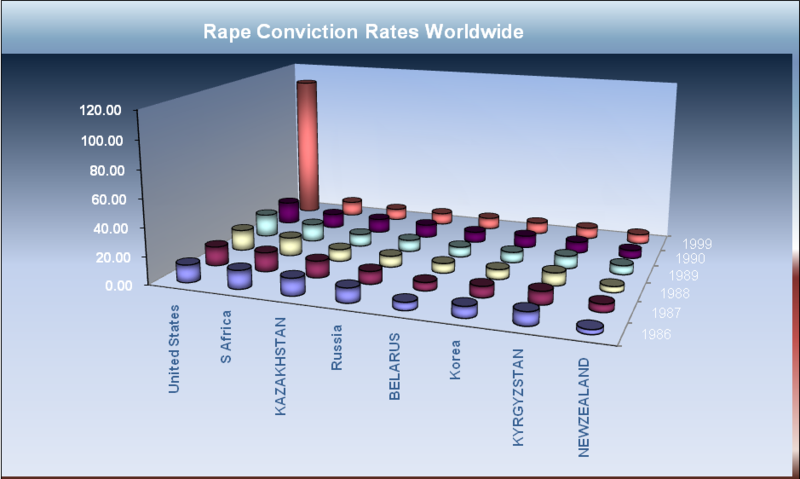 2% of women and 0% of men relate crime and nationality. 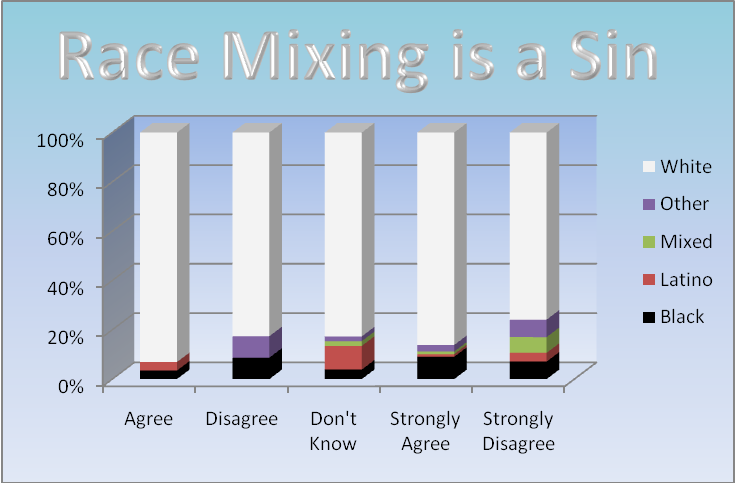 9.5% "Strongly Disagree" with exile by all three options. 0.3% "Don't Know" about $35k. 0.7% "Don't Know" about $200k. The remaining 10.3% disagree with all exile options. 0.6% "Strongly Agree" with $35k. 0.9% "Don't Know" about $35k. 0.96% "Strongly Agree" with $200k. A total of 11.3% disagree with all exile options and 88.7% agree with or don't know about the three exile options. 0.8% "Strongly Agree" with a $35k reparation. 1.1% "Agree" with a $35k reparation. 1.2% "Strongly Agree" with a $200k reparation. 0.4% "Agree" with a $200k reparation. 0.7% "Agree" with a $35k reparation. 0.5% "Don't Know" about a $35k reparation. 0.9% "Dont' Know" about a $200k reparation. 31% relate crime to race, and 100% of them favor at least one exile option. 5.7% relate crime to drugs, and 48% of them favor at least one exile option. 100% of those who relate crime to age were blacks, and 33% of them favor at least one exile option. 58.3% relate crime to poverty, and 83% of them favor at least one exile option. 34% believe it was a sin for Solomon to marry non-Israelite women, and 98% of them favor at least one exile option. 41.7% believe that blacks and Whites cannot have a common ancestor, and 100% of them agree with at least one exile option. 13.2% don't believe that blacks were why four cities which were Murder Capitols of the World were in the US, and 79% of them oppose all forms of exile. There have been 422 responses to the poll, and we would like to exceed 3,000 just to be sure to get a representative cross section of American opinion regarding this crucial issue. So please tell your friends and neighbors about it so we can reach those numbers. All of the data is in a data base which validates each entry by IP address, type of browser used, operating system, windows resolution, and other information which would make it impossible for one or ten or even 100 people to fraudulently administer the poll. Part of fhis data base will soon be on line so you can query it by each of the responses and match that with their opinion about exiling blacks. To keep those who responded from being spammed or harassed, the complete IP address, complete email addresses, complete names, and complete phone numbers, will not be in this on-line data base. You're invited to join the Exile Blacks Forum to express your opinion or just to keep up to date with the progress of this vital effort. 8% of those who "Strongly Disagree" with exiling blacks with no reparation also "Strongly Agree" or "Agree" with exiling blacks with a payment of either $35,000 or $200,000. 6% of those who "Don't Know" also "Agree" or Strongly Agree". 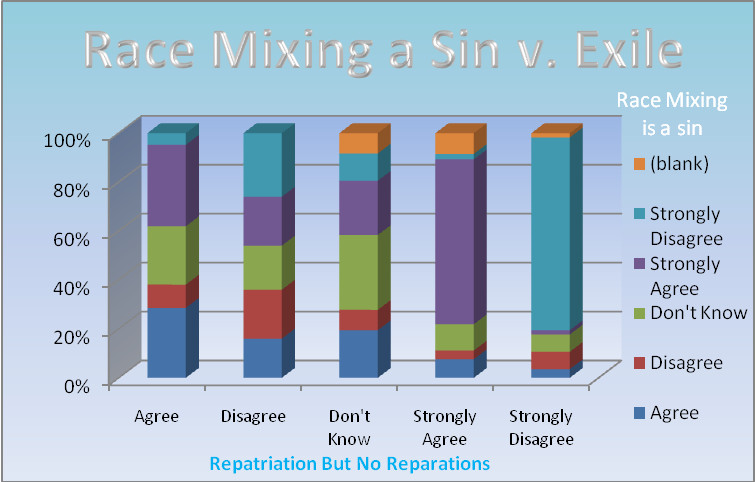 11% of those who "Strongly Disagree" or "Disagree" with a reparation payment of $35,000 also "Agree" or "Strongly Agree" with either no reparation payment or a $200,000 reparation payment. Of the 16% who "Strongly Disagree", 22% "Agree" or "Strongly Agree"
with exiling them with either a $35k or $200k reparation payment. exiling them with either a $35k or $200k reparation payment. "Disagree" or "Strongly Disagree" with exiling blacks at all. 22% agree with reparations of $35k. 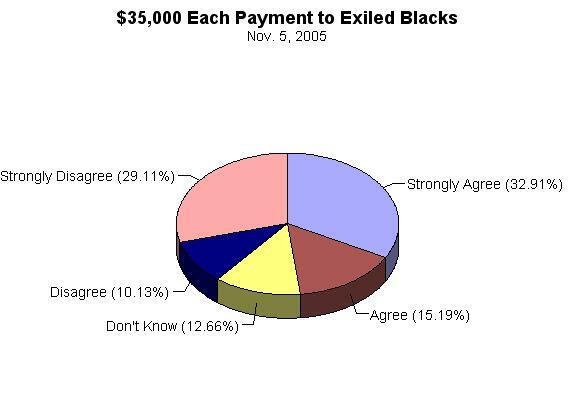 68% disagree with exiling blacks with a $35k reparation payment. Of the 29% who "Strongly Disagree" , 9% either "Agree" or "Strongly Agree" with no reparation payment or one of $35,000. Of the 9% who "Don't Know", 4% either "Strongly Agree" or "Agree" with no reparation payment or one of $35,000. Exiling blacks will also save 30,000 lives per year from traffic accidents. Copyright � 2005 Christianparty. All rights reserved.